What is a Y rod? The Y rod is the traditional tool of the water dowser and is still favoured by many water dowsers both professional and amateur. Y rods can be of any size and are typically one to two feet in length. Wooden Y rods are generally best when freshly or recently cut so that they are still somewhat springy, although some dowsers have favourites that they keep using over a great length of time. Hold the two "legs" of the Y rod one in each hand, palms upward and thumbs pointing outward. The single leg of the Y should be pointing away from you, held at or somewhat above the horizontal, with the arms a comfortable distance out from the body somewhere between waist height and chest height. It is necessary to hold the rod in such a way that there is some degree of tension in the Y rod, so that a dowsing response can quickly develop over the target of search or in response to a question. The Y rod has only two responses - a swing of the single leg upwards or an equivalent swing downwards (gentlemen beware). 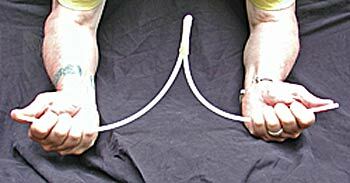 You can quickly establish your "yes" and "no" responses by asking for them as you position the Y-rod towards the dominant and non-dominant sides of your body, and once known in which way the Y-rod reacts for "yes" and "no" you can use it for simple question answering similarly to the pendulum and other dowsing tools. The classic use of the Y rod is in finding linear features such as water veins or points along them such as the best place to dig or drill a well. Direction finding with the Y rod is achieved by first posing a clear question - "where is the best place to site a well for my new home ?" while holding the Y rod out in its search position and then slowly rotating your body until the Y rod dips or rises strongly. The direction in which the single leg of the Y rod is pointing when the dowsing response occurs is the direction in which you should walk to find your target, or you may choose to repeat the procedure from a second point and get two indicated lines for triangulation - where the lines cross "X marks the spot". Once you have a direction to proceed towards your target, again hold the Y rod out in search position as you walk steadily forwards. You will feel the Y rod begin to either dip downwards or pull upwards as you approach your target and it will typically fix into a vertical position over the exact location that you seek. Sometimes your Y rod will make a complete and enthusiastic 360x rotation in your hands when you reach your target (gentlemen beware). Once you have found your target you can get more information about what you have found by asking "yes" / "no" questions using your previously established "yes" and "no" responses - "is this a vein of potable (drinkable) water ?" - is this the drain leading to my septic system?" If necessary you can follow the feature that you have located by swinging the rod repeatedly over the vein or line as you walk along it and tracking the point at which the dowsing response occurs. Remember that features such as water veins and energy lines have a centre, two edges and sometimes a dowseable "aura" out beyond their anatomical edges. Many dowsers find Y rods clumsy and awkward to use, preferring a combination of pendulum and L-rod; however the Y-rod retains its popularity and great loyalty is displayed towards it by a great number of dowsers, particularly amongst the water dowsing community. It is certainly a tool that deserves a respectful acquaintanceship, and if you choose it as your preferred dowsing helpmate you will be following in a grand tradition stretching back at least as far as the recorded history of dowsing itself.